Hopwood-based artist Paula Hamilton visits two exhibitions in the local area. I love Compton Verney. It’s a proper, big art gallery with lots of extras – the impressive 18th-century mansion was designed by Robert Adam, set in 40 acres of parkland landscaped by ‘Capability’ Brown. So when visitors arrive, they walk through the most amazing landscape involving lakes, bridges and rolling grassy vistas, until the house itself comes into view. And “splendid” is the only word to use – it is clear to see why the place is now used as a wedding venue and has been used as a film set. 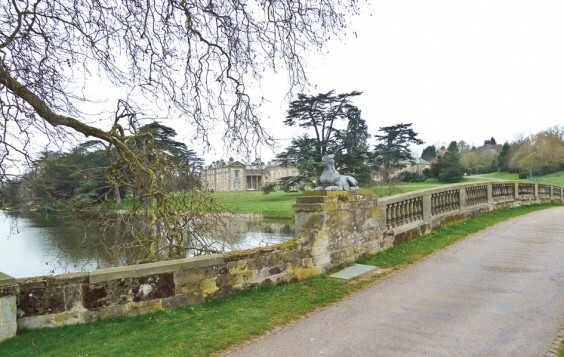 Sir Peter Moores was a philanthropist and art collector, who made his millions through Littlewoods football pools, and it was The Peter Moores Foundation which originally bought Compton Verney in 1993. The concept was to restore the house and grounds and to present artworks to the public in accessible ways. And in 2004 Compton Verney was ready to open its doors. If you are visiting in the near future, there are two exhibitions plus the eclectic permanent collection to be seen – and I’m not talking about rooms and rooms and an overwhelming quantity of art. These are smallish, easy to view, very likeable shows. Into the Light is all about Impression-ism. What is really interesting is that the focus here is not simply to present the French Impressionists but to demonstrate how the British influenced the French and vice versa, and how they Channel-hopped to visit each other, share ideas and techniques and to paint each other’s landscapes. As if to underline how connected the British and French painters were at this time, the subject matter is of British and French coastal and rural scenes. So there is a Renoir painting of a Guernsey scene as well as the British artist, Philip Wilson Steer, painting children paddling on Walberswick beach. Whether or not you are familiar with these paintings, I guarantee you will love them. As both the British and French Impressionists painted outside, en plein air, the representation of light was one of their most significant obsessions and the light in this collection of paintings is really beautiful. The representation of light is also massively important in the second exhibition currently running at Compton Verney, Gainsborough’s Landscapes, even though about 150 years in time separates the two shows. Gainsborough is probably best known for his fine portraits of the 18th century great and good; people in wigs, breeches, frocks and frock coats. These paintings are huge and dramatic, more “stagey” than the simple beauty depicted by the Impressionists, but a wonder to stand in front of and imagine oneself inhabiting. Gainsborough painted relatively few landscapes compared to the number of portraits he completed, but he regarded them as his most important works. He describes them as coming “from his own brain”, and they are certainly works of imagination and originality. An added bonus at Compton Verney is its excellent restaurant. The ambiance is stylish and simple and the food really delicious, with a menu consisting of dishes made from locally-sourced ingredients. Looking at art is a hungry business and whether you break for a slice of cake or a main meal, you will not be disappointed. Compton Verney is just 30 to 40 minutes away from the Alvechurch area so perfect for a day, or half day, out. Slightly nearer to home is Bromsgrove Festival (http://www.bromsgrovefestival.co.uk) which offers music of all kinds and runs until May 12. It is accompanied by the large annual Bromsgrove Art Society Art Exhibition, held in All Saints Church in Bromsgrove. This exhibition, which has been on since April 21, ends on Saturday May 5 – so you just have time to pop in and see the work of many Worcestershire artists. The exhibition is inclusive so you will find artwork by professional, semi-professional and amateur artists. The annual exhibition has been running for more than 20 years and is always a crowd puller and crowd pleaser. A large proportion of the money raised goes to All Saints Church – this year the renovation of the church tower is to be targeted. This is a group show of 30 local artists, with a great variety of art including paintings, sculpture, ceramics, textiles and glass – and it will be the first time I show my ceramic pieces. The aim is to make art accessible and affordable, with prices from £50, so hopefully there will be something for everyone.